Speaking up for Gia | What Would Gia Say? May 14th, 2015 was our families first Apraxia Awareness Day since Gia’s diagnosis. I started the day with the posting of my video. It was well received, and seemed to make an impact on a lot of people. I’m confident that my video did what I had intended for it to do. I think it brought comfort to my fellow Apraxia families, and I think it gave others a much better understanding of this mystery speech disorder they had never really heard of. I was amazed by all of the people who showed their support by not only sharing my video, but wearing blue to recognize the day. Our family of course dressed in our blue that morning, and I got a quick picture with my kiddos to commemorate the day. If my dog could hold a camera, my husband would be in there too :). Nick is holding his IPad and Gia is holding a snack…typical. I love this picture for so many reasons. Soon after this picture was taken, my husband and I would be sharing Gia’s story for the very first time in a public setting. 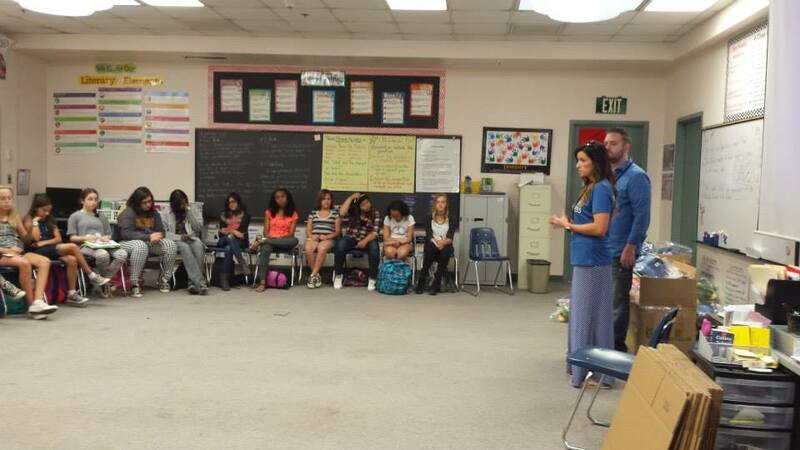 That morning, we were scheduled to speak in Miss Kelly’s 6th grade classroom at Kyrene Centennial Middle School. Our family was to be part of a “Practice of Compassion” service project for these students, which I’ll explain shortly. This amazing opportunity was gifted to us by SCOTT Foundation, a non-profit organization that provides educational programs and experiences that inspire children toward selfless service. In a previous post, “Differently Gifted”, you can learn a little more about SCOTT Foundation, and my dear friend Colleen, who created it. I met Colleen at the Middle School just as the classes were changing over, so things were a little chaotic. It was a fun kind of chaos that brought back some fun memories. I was standing just outside the classroom, waiting for my husband, Jeff to arrive. I had asked him a week prior if he wanted to join me, and he happily agreed. Jeff is a pretty private guy, who supports me behind the scenes. Of all the things I involve myself in, I knew this was one he would appreciate being a part of. This was a big deal for me, and he knows when it’s time to step out of the shadows. I started to feel nervous and unsure as I waited for him. I felt vulnerable without my laptop in front of me. I couldn’t write – I had to talk, and people were listening. Just when I thought I might throw up, a bubbly 6th grade girl popped out of the classroom and with a sweet little grin on her face says to me, “I hope your daughter learns how to talk soon!” I just looked into her eyes in disbelief. No one had ever put it so innocently and clearly to me before. As adults, we generally don’t use such simple terms. This little girl was telling me what everyone ultimately wants to say, clear-cut and right to the point. It was an amazingly refreshing experience. So I cried a little inside, I may have gotten out a thank you, and just asked if I could hug her. I took a huge breath of relief. This was going to go better than I thought. Jeff arrived, and Colleen surprised him with a, “You’re going to be reading a book to the class”. Now Jeff prefers to be the background guy, so he was a little like, “Hehehehe (uncomfortable)”. He hesitatingly agreed, and Colleen happily giggled. I know Colleen well, and I knew what her giggle meant. It meant something along the lines of, “Oh, look how cute Jeff is…he really has no idea what’s about to transpire…”. Meanwhile, I’m standing there in the middle, rambling on like an idiot, “You’ll be fine Jeff. He’ll be fine. You’re good at reading stories. He’s good. You’ll be fine Jeff. He’ll be good. Yep. He’s good at books.” And……….break! Colleen started the class off by briefing the kids about SCOTT Foundation. Sharing with them the joys of being kind to others. Jeff was up next, and he was already looking more comfortable. How could you not after listening to Colleen? The story he would read is a book written by Vicki Savini called, “The Light Inside of Me”. This book encourages children towards listening to their inner feelings, and making good choices. It was the perfect ice breaker for us and the students, and so fitting for a SCOTT Foundation occasion. Colleen stood up a final time, explaining to the class the service project that they would be participating in. She told them about the little girl named Gia who suffers from a speech disorder. She asked that they really think about what it would be like to struggle everyday just to speak what’s on your mind. I could already see the wheels spinning in their heads. Colleen then introduced Jeff and I as Gia’s mom and dad, telling them that we were here to share Gia’s story. 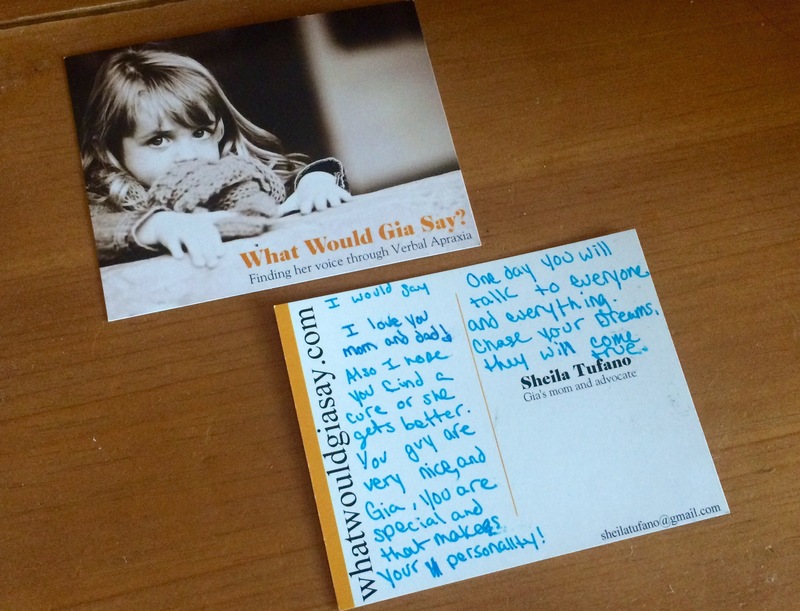 All of the students were given a “What Would Gia Say?” postcard, and asked that after they’ve heard from Gia’s parents, to write down their thoughts to this question, “If Gia could say anything, what do you think she would say?”. This would be their selfless service – giving a voice to a child with apraxia, and providing comfort and forever memories to her parents. All eyes were on me. These were 11 and 12 year old kids, and It was my responsibility to explain the complicated disorder, as well as the feelings that come with it. I had no idea what to expect from them, or how they would take to me. I had no real plan, I just started talking. I proceeded with Gia’s story with Jeff by my side, popping in from time to time. Jeff surprised me by sharing more of the emotional side of apraxia than I did. He was opening his heart to these students, and I felt myself doing the same. The more we talked the more I realized that these kids were actually listening. They looked curious and concerned. Toward the end of our talk, it was clear. These students truly understood Gia’s struggle. They had questions, lots of questions, great questions! They were the kind of questions that took thought and care to come up with. The time came for their Practice of Compassion. If Gia could say anything, what would she say? Without a wink of hesitation, they started to write. It was emotional just watching them. Gia was just a name, she was just a face on a postcard, just a story. None of that seemed to matter to them. They wrote like Gia was their sister. It was time for the most anticipated moment of the morning. One-by-one, the students would stand and read aloud, giving our daughter a voice, telling us what it was she wanted to say. I was no where near prepared for what I was about to hear. The first student stood up and read us her thoughts. I just remember being shocked at what she said. Her words were so much deeper and so much more thought provoking than I ever imagined a 6th grader could be. It was so unbelievable, that I couldn’t even cry. I was just sort of stunned. She walked the postcard up to Jeff and I, we posed for a picture, and she picked up her signature SCOTT Foundation pillow pet. What this girl had to say was no fluke, it just kept getting better. Not only did they take the time to share what they think Gia might say, but almost all of them took the time to write their own words to Gia herself. It was amazing. After the class ended and the room was starting to empty, I looked over to see two girls still sitting and writing. They ran out of room on their postcards and got a piece of paper from their notebook. They weren’t worried that the bell had rung, they weren’t stopping until they were done. The letters they wrote were specifically addressed to Jeff and I. They had taken the time to write to us, Gia’s parents, filling us with love, support and encouragement. My heart was so full, I couldn’t even take anymore. I could never truly describe the time I spent with Miss Kelly’s class, or how it made me feel. It’s something you can’t put in to words. They gave me one of the most special gifts that I’ll probably ever receive. It was one of the most pure and genuine experiences I’ve had in my life. They empathized on a different level. It was on a level that adults can’t understand, because we’ve just been here too long. These 6th graders are still new to this world, just trying to find their place, just trying to fit in. They want Gia to fit in too. Just the thought of this three year old girl struggling with being different, affected them. These kids gave me hope. They made me feel better about Gia starting school someday. All we ever hear about is the bullies. Kids like this don’t make the news. I didn’t even know that this kind of good could exist in kids who are growing up in a world with a whole lot of bad. I will share these postcards with Gia some day, taking them out during different phases in her life. There will come a time when Gia’s therapy days are over, and this is all a thing of the past, but Apraxia will always be a part of Gia, it will always be with her. These little gifts we receive along the way will be comforting reminders of the countless people that were fighting for her voice to be heard. So you can experience even a little of what Jeff and I did, I took some shorts clips from what the students wrote, and listed them below. Enjoy! Thanks again for sharing Sheila! Thank you for reading Alan! Your writing is amazing as usual Sheila! Oh my goodness I was there and still cried through reading your post as if we were in the classroom still. Just beautiful!!! I’ll be sure that Ms. Kelly and Vicki Savini see your post as this will touch their hearts as well. Much love my friend, you continue to inspire me to love deeper and hug stronger. I’m so glad you enjoyed the post Colleen! As you know, it was an experience that wasn’t easy to sum up in a single post. I can’t thank you enough for making that day happen for our family. We are forever grateful. Pingback: Sharing my story (the truth) | What Would Gia Say?